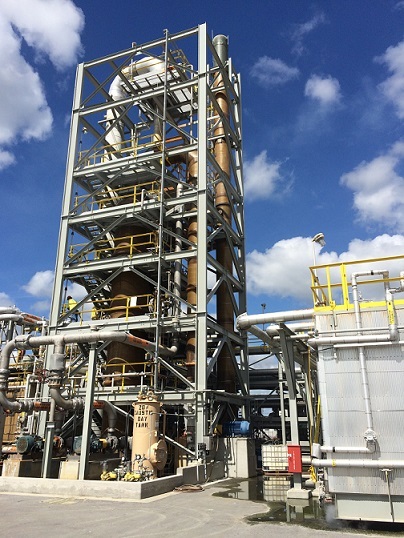 U.S. company Mosaic Fertilizer recently started up a new sulfur melter at its New Wales, FL, facility using a MECS DynaWave reverse jet scrubber licensed by DuPont Clean Technologies (DuPont) to remove SO2, H2S and sulfur particulate. Mosaic is a leading producer and supplier of concentrated phosphate nutrients and reportedly is the largest global consumer of sulfur. Mosaic Fertilizer installed the new melting facility – at 1 million tons per annum sulfur capacity, the largest in the world – to diversify its supply of sulfur. The melter allows the company to receive, melt and filter solid, globally sourced sulfur. As this project was being developed, Mosaic evaluated technology options to scrub the melter system off gases. Melter off gases can contain sulfur vapor, which condenses to a fine, hydrophobic particulate. Because the potential was high for conventional packed scrubbers to plug with the sulfur particulate, Mosaic selected the unique, open design of a DynaWave wet gas scrubber. Froth zone technology allows for a high level of particulate removal, while simultaneously scrubbing SO2 and H2S. Licensed by DuPont, MECS DynaWave scrubbers are designed to work with a variety of reagents and handle multiple functions in one vessel. As such, the process makes it possible to quench the hot melter off gas and remove potential particulates while absorbing the acid gases from the gas stream. Over the last 40 years, the MECS DynaWave technology has been successfully installed and used at more than 400 sites around the world in different industries. The large nozzles and open vessel design of the DynaWave scrubbers result in units that are virtually plug proof and able to handle any possible sulfur particulate entrainment. This results in higher on-stream time, lower maintenance and operational expenditures for the operator.